We’re starting a new weekly feature on the blog today called Tuesday’s Tip. Each week we’ll share a favorite tip or technique with you. This week’s tip is from Kirsten Hipsky our Design Manager. She’s addressing the problem of rowing out, where the size of your knit stitches are different than your purl stitches. These alternating rows of larger stitches will appear as ridges on the front (knit side) of stockinette fabric. On the back (purl side) of stockinette fabric, these rows will appear as valleys. Rowing out is more pronounce with less stretchy yarns such as cotton. 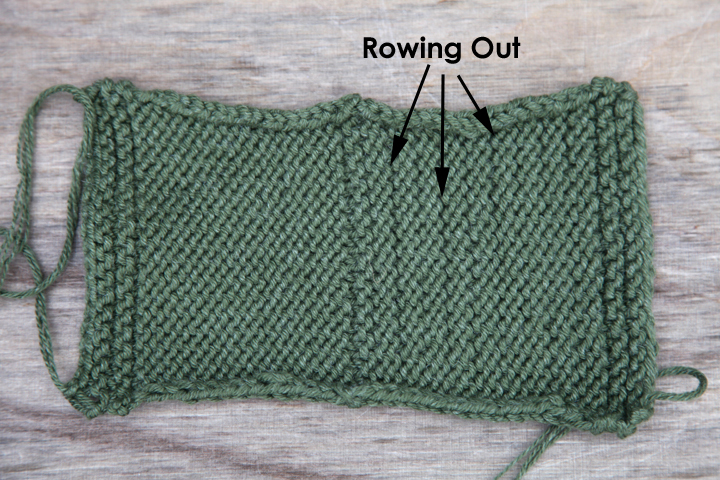 Rowing out can also be a problem in patterns where you switch from knitting flat to knitting in the round. A pullover sweater is a good example where the yoke and body may be knit in the round, but the sleeves are knit flat. 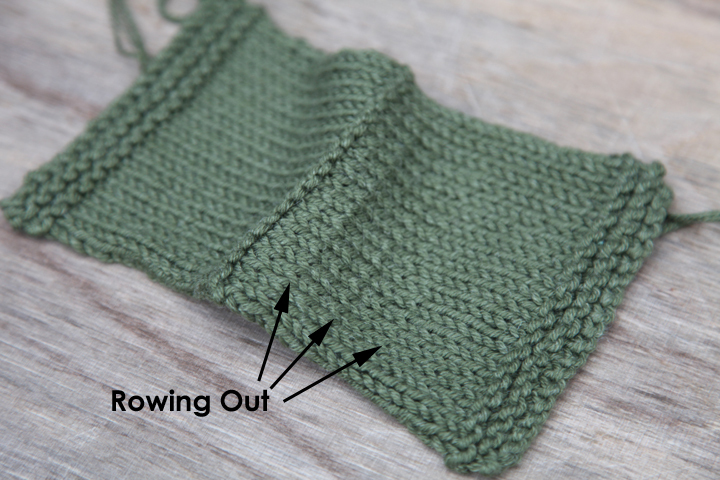 Kirsten’s Tip – If you have problems with rowing out, try working with two different size needles! The needle in your right hand is the one that determines the stitch size for that row, so use a smaller needle for stitches you want tighter and a larger needle for stitches that you want to be looser. Do you have a problem with rowing out? What ways have you discovered to make your knit and purl stitches more even? This entry was posted on Tuesday, January 24th, 2012 at 12:00 pm	and is filed under Tips & Techniques. You can follow any responses to this entry through the RSS 2.0 feed. You can leave a response, or trackback from your own site. The tenseness in my shoulders seams to cause my fingers to hold the thread too tight, when I first pick up my work. When I learned to knit- I knit Eastern combined- where my purl stitches were ‘picked’ only backwards. I re-learned regular purling so that my stitches would be mounted the direction most patterns assume they will be- so that I could learn lace knitting easier. Now when I want to minimize rowing out- I go back to knitting Eastern combined on large stretches of stockinette stitch. It really helps me! Rowing out is especially noticeable when reverse stockinette is the background for cables on the right side. Different size needles won’t solve the problem when there’s a mix of stockinette and reverse stockinette in the same row. To prevent this I wrap my purl stitches the “wrong” way (clockwise) on these right-side rows. This puts less yarn in each stitch. Be careful to knit into the back of these stitches when they come up on the next row. You’ll know which stitches these are, since they’ll sit on the needle with the right-hand strand of the stitch in back of the needle instead of in front. I knit by picking (Continental style). When I notice rowing out, it usually seems to have something to do with the way I’m allowing the yarn in with my left hand. Purling is a very different motion from knitting in this kind of knitting. Held in front of the work rather than in back, the yarn is a little harder to control, and a smooth or thin yarn may slip a little too easily. (Dry hands can affect tension, too.) To snug things up, I wrap the yarn another time around the finger that is tensioning the yarn, so the yarn slips into the knitting zone a little less easily. That makes it so the stitch is formed a little closer in and a little more tightly. Good tip! I always feel like I’m struggling when I purl. I will try this and see what happens! I never knew there was a name for that!!!!!! For most that row out, it’s their purls that are larger than their knits. Try going down one needle size on your purl rows to see if that helps. This is a great idea – giving tips like this. Please keep it up? Good tip Gwen. When mixing stockinette and reverse stockinette in the same row, Kirsten’s tip won’t work. Appreciate the article. I have trouble with rowing out. One experienced knitter said to purl tighter. Help a little, but not completely. Tried different size needles. But that is not always possible. Thanks again. I have been knitting for year and never knew that is what was going on. Ha, you can learn something new everyday!! Thanks for the tip! I’m with Gwen and Peggy – I learned to purl “Eastern combined” (or “Combination Knitting” which is taught by Annie Modesitt) to avoid this issue. It is also faster overall, and may use less yarn (slightly smaller stitches = less yarn used) – however you have to carefully check your row gauge to adjust for any change in stitch height. gotta say, I guess I keep it pretty even, but, if I ever see this going on, I know now what to do, so, thanks for the tip. Wow – I’m a fairly new knitter (4 years) and I never heard of such a thing, but I have seen it in my knitting!! Thanks for the heads up! Good discussion! I Always called using two needles, one larger then the other, condo knitting. and I always thought what you call rowing out to be the result of a tension difference in purling and knitting. I like the idea of knitting tips. thank you. Would knitting backwards instead of turning to purl fix the problem? I learned to knit English however my mother “flicked” and I never knew the difference until I got on YouTube. Flicking uses the working yarn in the right hand however it is faster than regular English in that you never put the yarn down. It can be done either with straights or circular needles. It’s speed is relatively the same for me as when I knit Continental — which I enjoy very much. I have never gotten rowing or rowing out using my Flicking method. I learned to knit Combined but still sometimes get the rowing effect. So I also learn Portuguese style which is also known as Around the neck knitting as the yarn is either tensioned going around the back of the neck or on a knitting pin. When I need my reverse stockinette to look primo, I knit this way. It is incredibly easy to learn it. I don’t use it all the time but it does solve the problem. It is even smoother than my Flicking method. I don’t find I like using it for everything. So I vary my knitting method by the project. The means of working individual stitches in knitting forwards and backwards (which I also know) I feel has improved my overall skill. I have stopped frogging so much and if I do have a mistake, reknit just the portion where the mistake is so long as it is not further than three or four inches. That is why Continental is great. All knitting styles are enjoyable. But for general knitting, I tend to use Continental Combined now (except for reverse stockinette). Also — Portuguese looks identical between straights and circular so if you have a project where you need to use both kinds of needles, it means there is no reason to use a steek. My knit stitch is the problem for me, regarding rowing out. What to do. Do you use interchangeable needles? What has helped me while working flat is using a smaller size needle on the row that I have a bigger gauge on. If your knit stitches are bigger than your purls, why not try using an interchangeable needle with two different tips? You could even do the same with straight needles!